Road trips have the potential to be a helluva lot of fun. Ski trips potentially even more so. Where to go on a road trip, that's also a ski trip? Well, BC, Canada most likely has the best mountains of them all. Combine these three factors together and what do you have? The worlds first ski road trip. First of all, you get to ski in British Columbia, Canada. Famous for some of the best terrain on this planet topped with incredible snow, BC should be high up on your ski bucket list. Revelstoke, for example, has the highest vertical drop in all of North America. Fancy it? The beauty of living in an RV is that home is where you park it. 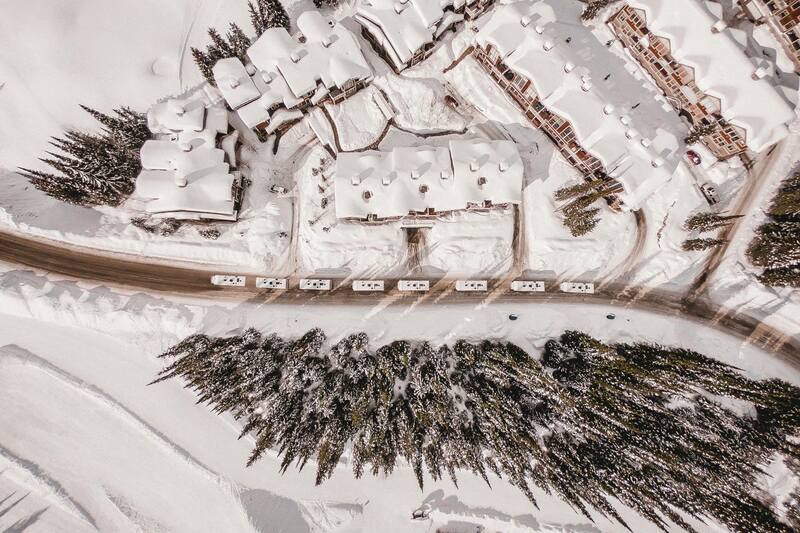 We usually choose next to the slope for maximum convenience but, should you wish, you can park outside your favourite restaurant or après-ski bar. Your call. Since we’re on the topic of RVs, this beauty of a dream mobile is easy to fall in love with. Thanks to a fully fledged kitchen, bathroom and enough space for 5 people to live comfortably, you’ll feel right at home. Skis and boards are stored in a separate locker outside and once you’ve parked and opened up the slider there’s enough room for a small dinner party. Need convincing? Watch this. 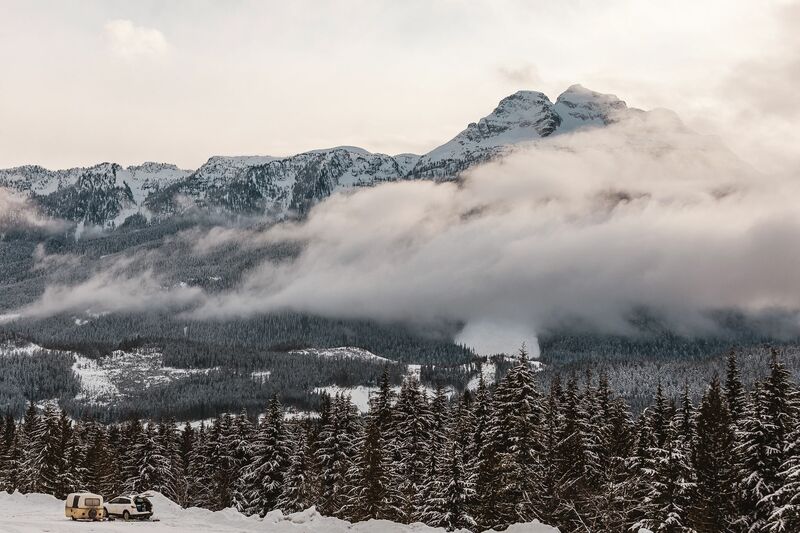 BC is famous for its incredible snow, the reason for this is the cold climate which keeps it fresh and crisp. 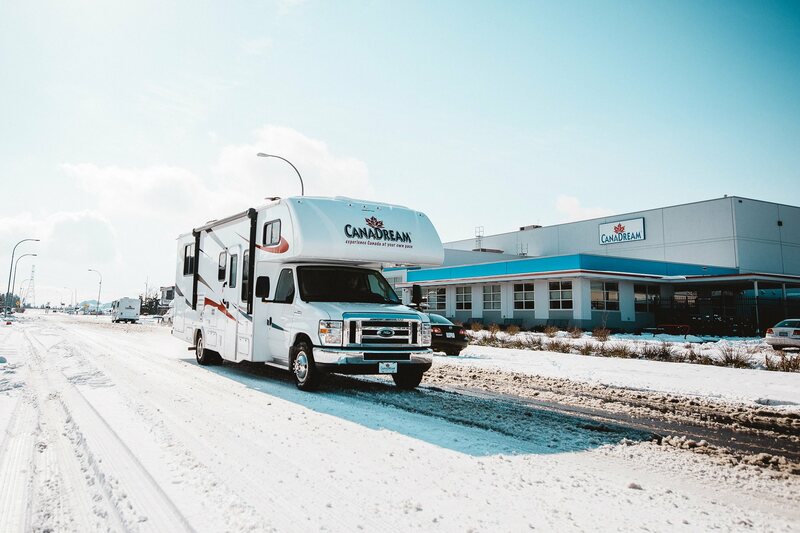 Luckily, our RVs have some serious propane heaters inside so you don’t need to worry about keeping yourself warm and ski clothes dry at night. 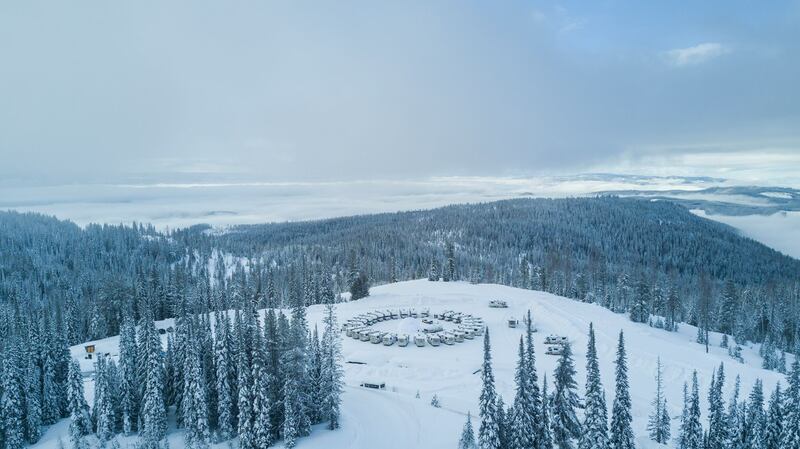 If you happen to be road tripping Canada with a group of 30 or more RVs, we strongly recommend parking them all in a circle. 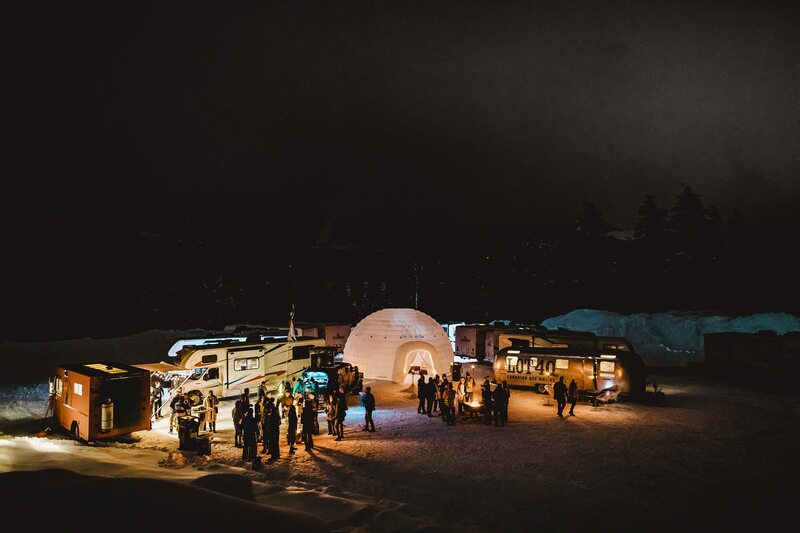 Throw in some fire pits, a whiskey bar on wheels, good music and of course a good group of friends; that’s an après-ski you do not want to miss! Your home has wheels, use them. You’re surrounded by some of the worlds best ski resorts and, in the name of exploring, you better test them all. 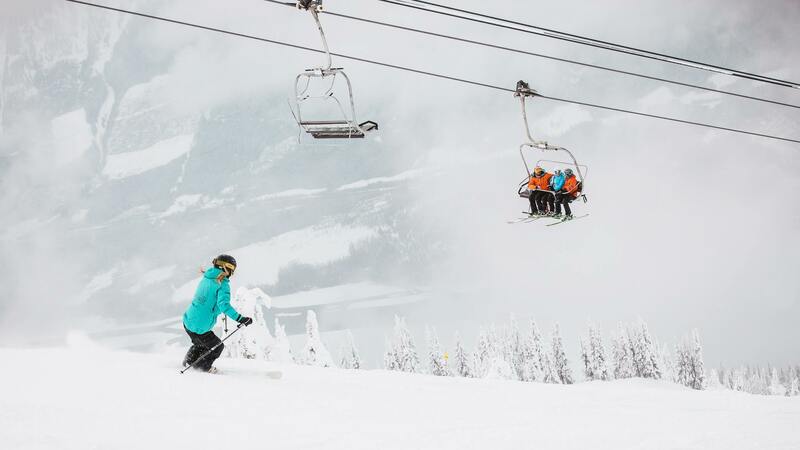 Revelstoke, Sun Peaks, Silverstar to name a few; the playground is entirely yours. Your home has wheels, use them. You’re surrounded by some of the worlds best ski resorts and the worlds best mountains and, in the name of exploring, you better test them all. Revelstoke, Sun Peaks, Silverstar to name a few, the playground is yours. 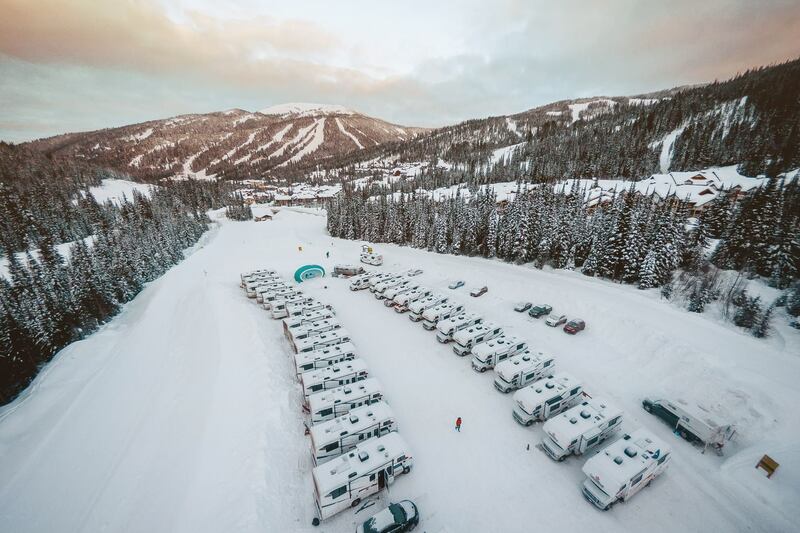 Our team at The Ski Week are proud to host the worlds first ski road trip. Asides from carefully curating a full programme of activities, parties, dinners and much more for you adventurers, we also know the best way to make the most of RV living. We provide the guidance you need; where to fill up your water and propane etc. and will always happily assist putting on snow chains and such for you on those powder days. Oh, and we also know the resorts as well as our hometowns. If you want to know where the best snow is, just ask! Skiing with old friends is fun. Skiing with new friends from all over the world is definitely better.